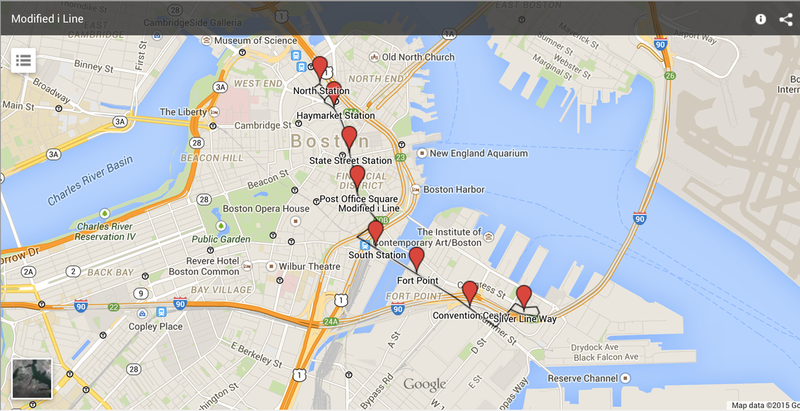 Boston is a world-class hub of innovation and culture. Whether or not we get the 2024 Olympics, this city needs and deserves a transit network that has the capacity to move all of its residents, workers and visitors from point A to point B. On this page, I propose a number of additions and modifications to Boston's transit network that will make getting around Boston much easier and less convoluted, even if traffic doesn't rise to Olympic numbers. The Seaport and Fort Point are two of Boston's most significant hubs of innovation, as well as two of the city's most rapidly-developing neighborhoods. The Seaport and Fort Point are also increasingly becoming destinations for entertainment, particularly dining, an impetus for traffic that will only grow with the impending Seaport Square development and other upcoming additions. 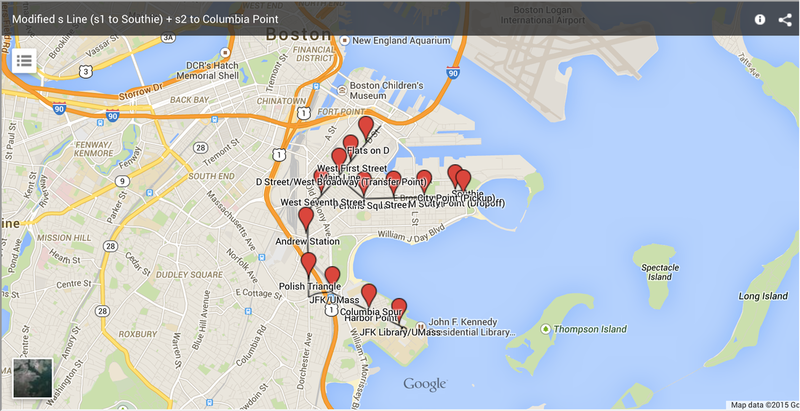 Naturally, there are droves of people who travel between the Fort Point/Seaport area and the rest of Boston. However, currently, getting to the area via transit is extremely convoluted. Getting to the Silver Line, which runs through Fort Point and the Seaport, from anywhere not within a 10-minute walkshed of South Station requires not one but two transfers, particularly when traveling from anywhere along the Green, Orange or Blue Lines. The Silver Line's role as a major route for getting to and from Logan Airport only makes the line's articulated buses more cumbersome, as they are crowded to the brim with both Fort Point/Seaport and Airport traffic. 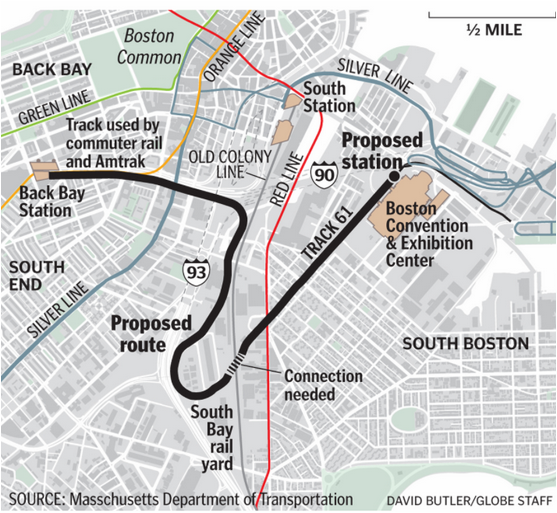 Currently, there is an official proposal to build a DMU line from Back Bay Station on the Back Bay/South End line to the Boston Convention and Exhibition Center in the Seaport. Such a line is on the dot in principle—in addition to taking stress off of the Silver Line, the line will connect the Back Bay to Fort Point and the Seaport directly, as well as provide Boston's western and southern "streetcar suburbs" served by the Green and Orange Lines with an easier way to get to Fort Point and the Seaport than going all the way downtown and making two transfers. However, the proposed DMU line will use a one-track line, Track 61, that has not handled significant rail traffic in years and will cost a lot of money to rehabilitate. Even with rehabilitation, Track 61 will not be able to handle very frequent service as it is one track wide. To get to Track 61 from the Back Bay, the DMU line will follow a long, low-speed, winding route through Cabot Yard and along Widett Circle that extends very far southward—almost to Roxbury! The proposed DMU line, which follows a rather long route all the way to the South End-Roxbury line before coming back up through Southie to Fort Point and the Seaport. Note that an additional connection must be constructed to make a fully continuous line. 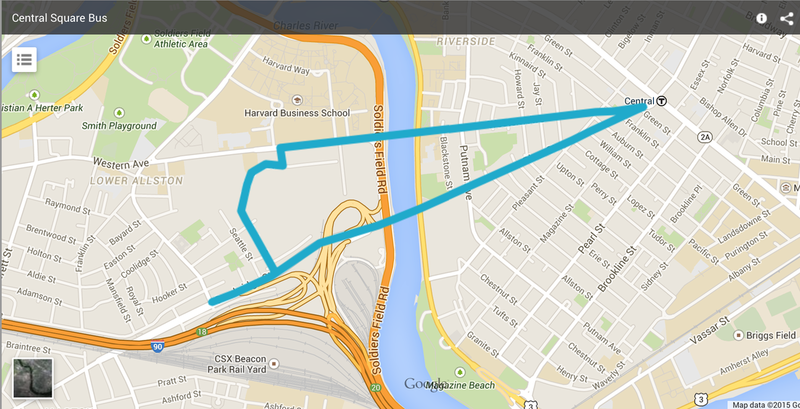 A much simpler, more direct and more cost effective solution would be to implement a Back Bay-Seaport bus line. Such a line could serve as an interim solution to the Back Bay-Fort Point/Seaport transit disconnect, if not a permanent solution—the DMUs would likely not be able to travel at very high speeds through South Bay and along Track 61, to the point that a bus may even provide faster service, particularly if the bus receives signal priority along the way. It has been proposed by the official South Boston Waterfront Sustainable Transportation Plan to create such a bus route. The proposed route can be found below; the full presentation is available here. 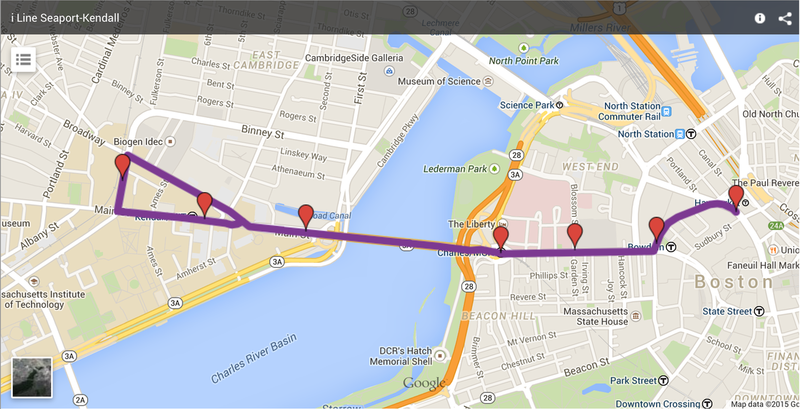 The bus would run via A Street and Berkeley Street towards the Back Bay. Towards Fort Point and the Seaport, the bus could run via Dartmouth Street and either the Pike or A Street (along the blue line). The A Street route would serve Fort Point more directly as well as stimulate the existing development/spur further development along A Street. Whereas train stations are costly to construct, it would be relatively simple to include bus stops along the route in the South End and Southie, two neighborhoods for which it is currently a pain to get to and from Fort Point and the Seaport. With connections at Copley and Back Bay Stations, the bus would make commuting to the Seaport from west and south of downtown much more reasonable. Additionally, the bus would bring even more energy and life to Fort Point and the Seaport by directly linking some of Boston's hottest spots for innovation, entertainment, dining and nightlife—Back Bay, Downtown, the South End/SoWa and Southie—to the Seaport. In order to streamline travel between the Fort Point/Seaport area and areas north of downtown (North/West Ends, Somerville, Medford, etc.) in the short term, frequency should be increased on the Number 4 Bus, an existing route with tons of potential. The Number 4 Bus is currently the only route that serves as a direct North-South Station Connector; currently, the bus only runs during rush hour. With Fort Point and the Seaport developing as rapidly they are, there will only be more commuters from north of Boston, as well as residents of Boston's northern neighborhoods and Cambridge/Somerville, who will want to get there. The coming Green Line Extension will likely bring even more transit traffic to Boston, putting even more strain on the current Green-Red-Silver/Orange-Red-Silver transfer routes used to get from north of downtown to Fort Point and the Seaport. 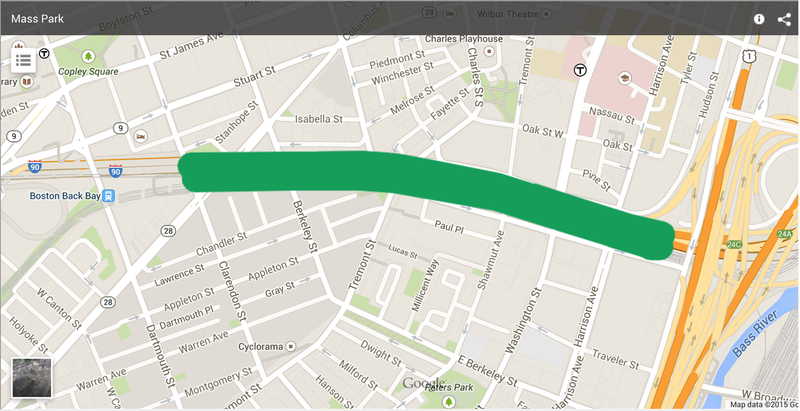 I have changed the i Line streetcar route through the Seaport from a loop to a direct two-way line along Summer Street. Summer Street is wide enough to accommodate dedicated lanes for trolleys, is centrally located within the Seaport and passes through relatively undeveloped parts of the Seaport whose growth and pedestrianization could be spurred by the trolley line. The i Line would receive a dedicated right-of-way covering Summer Street and D Street, as well as a dedicated bypass through Dewey Square over the existing exit ramp on the southbound side of the Greenway. 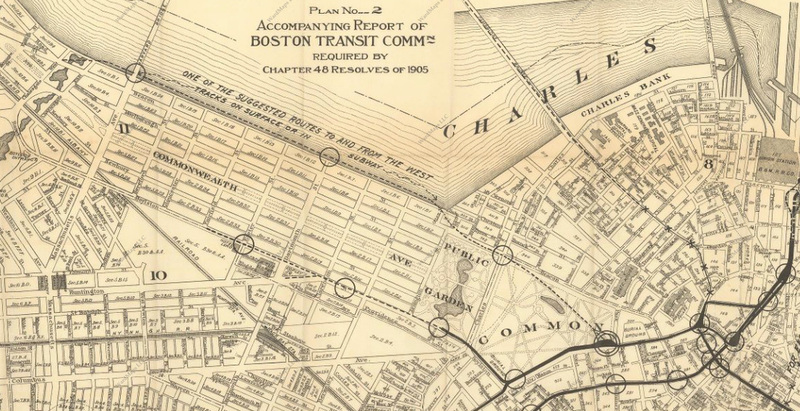 The i Line would then continue from South Station to North Station, serving as a North-South Connector, via dedicated lanes on Congress Street and New Chardon Street plus a contraflow lane on Friend Street in the West End/Bulfinch Triangle. In addition to directly serving local innovation and general trips, the i Line would be an attraction in itself, passing through the heart of downtown and some of Boston's most storied historical sites. The construction of the i Line's right-of-way through downtown would pave the way for the ultimate elimination or limitation of car traffic downtown as well as the simultaneous transformation of Congress Street into a wide, safe, pedestrian and bike-friendly trans-downtown boulevard. A redesigned car-free Congress Street could include wide sidewalks, dedicated bike tracks, trolley tracks and storefronts/restaurants with outdoor seating. It is important to note that, by connecting South Station and State Street Station, the i Line would serve as a Red Line-Blue Line connector, a resource Boston currently lacks, in addition to a North Station-South Station connector. 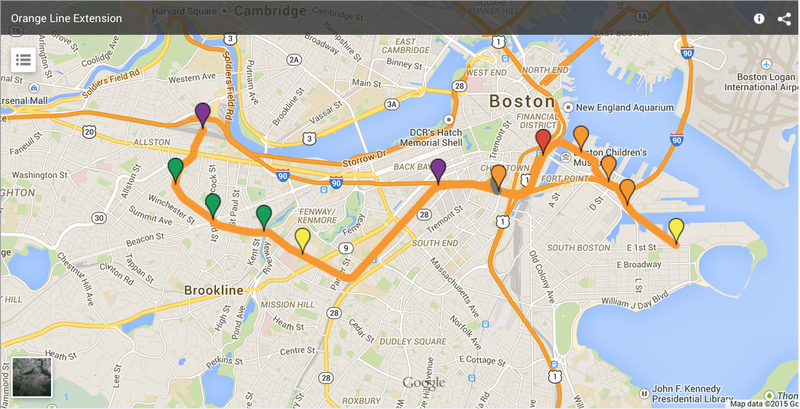 More detail on the i Line is available at "Five Key Future Boston Transit Investments". At D and Summer Streets, the s Line, a streetcar line, would join the i Line. I have modified the s Line, now called s1, to eliminate the circuitous routing originally proposed in favor of a direct trolley that would run along D Street in mixed traffic and, along wider, double parking-prone West Broadway and East Broadway, in a dedicated right-of-way, terminating at City Point. Alternatively, the s1 Line could loop back towards downtown along East First Street so as to preserve parking on East and West Broadways by only building a one-lane right-of-way. 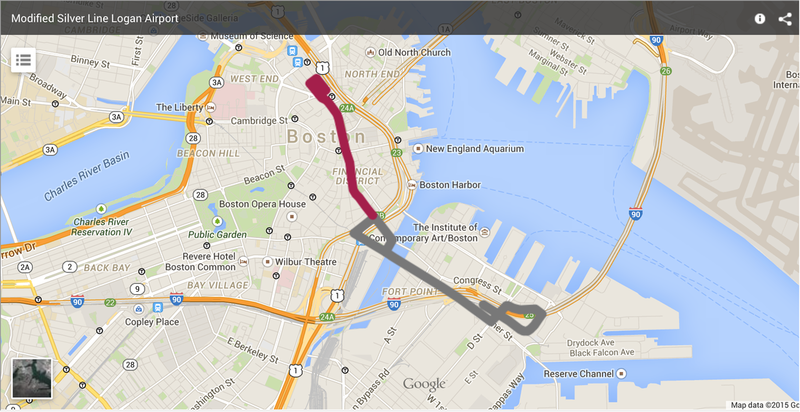 However, such a line would be less direct and would not serve Southie south of Broadway as well. 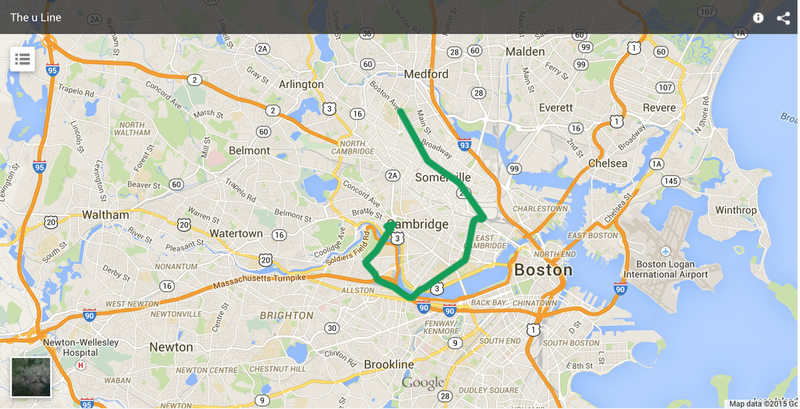 I have also added a second routing, s2, which would continue further south to Dorchester. The s2 Line would run along D Street until Dot Ave, along which it would continue southward to Columbia Road. Ultimately, the s2 Line would continue onto Mount Vernon Street and terminate at Columbia Point—home of the JFK Library, the rapidly-expanding UMass Boston and the soon to be redeveloped Bayside Expo Center and Boston Globe parcels, among other significant Boston developments. The s2 Line would run in mixed traffic along Dot Ave and along a right-of-way on Columbia Road and Mount Vernon Street. Both s Lines would receive signal priority at all intersections. The r Line, a bus rapid transit line, would run to Silver Line Way from Longwood and Roxbury via the limited-use South Boston Bypass, a right-of-way on Melnea Cass Boulevard and mixed traffic everywhere else—along with the possible reservation of often-gridlocked Longwood Avenue for emergency vehicles, deliveries and transit only. The r Line would receive signal priority at all intersections. Upon reaching Silver Line Way, the r Line could continue onwards to South Station; continuing further along the i Line to North Station would be inadvisable with the i, s1 and s2 Lines already providing frequent service along that corridor. I have streamlined the r Line's formerly circuitous routing through Longwood in favor of a shorter turnaround loop that would still provide direct service to the area's medical buildings as well as to the Fenway area. The Elm Hill Loop I proposed originally that would have run through the heart of Roxbury has been scrapped in favor of a direct, non-loop route that will serve a greater area of Roxbury to be discussed later on this page. The extended Orange Line would provide an unparalleled level of transit coverage. The Orange Line Extension would significantly streamline the journey to the Seaport, as well as to downtown and the South End, for riders from Southie and from north and west of downtown—particularly for Allston, Brighton, Brookline and the Longwood Medical Area. What was once a three-train journey would now be a direct, one-seat ride (Beacon Park Yard/Allston-Brighton—City Point/Southie via Brookline and Back Bay). Significant stress would be taken off of the currently-packed Green Line—there would be close connections between the Orange Line and all four Green Line branches, as well as West Station at Beacon Park Yard. The Green Line would still see heavy use as a feeder for the new Orange Line, as well as for direct trips to areas of downtown and north of Boston further from the Orange Line. The new Orange Line would also ease the journey from the heart of downtown (around Park Street and Boylston stations) to the Seaport. An additional switch, shown on the map above by a short silver line by Ink Block Station, could be installed in order to allow southbound Orange Line trains to divert eastward towards South Station, the Seaport and City Point, thereby creating a new Orange Line route—Oak Grove-City Point. An Oak Grove-City Point Orange Line route also would, like the i Line and the 4 bus, serve as a North Station-South Station connector, a gaping hole in Boston transit last filled by the Atlantic Avenue Elevated, which ran from 1901-1938 and was a branch of Boston's Main Line, the Orange Line's predecessor. As a North-South Connector, the Orange Line extension would closely, though not exactly, parallel the i Line along Congress Street through downtown. Yet even so, the i Line would be a prime resource for short trips and would serve as an impetus for a car-free, pedestrian/bike-friendly downtown and Seaport. Not to mention that the i Line has potential for additional trolley line extensions from downtown and the Seaport, as I will explain shortly. Map showing the Silver Line's alignment along Atlantic Avenue. 1904 image showing the two-track lower loop portal at far right. 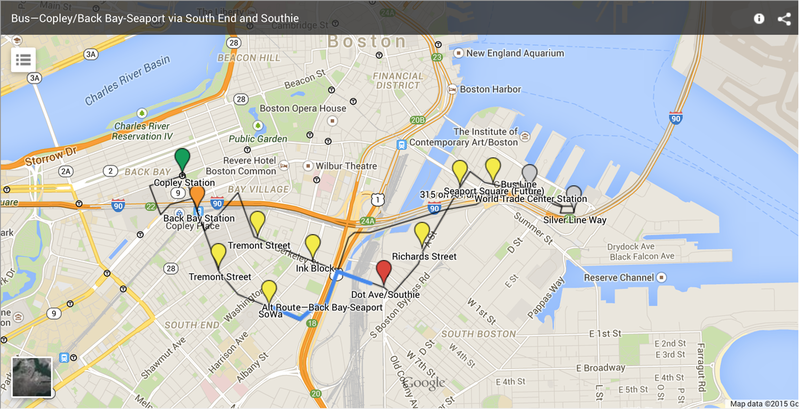 Note: South Station has since been downsized. Orange Line trains would subsequently continue onwards through the Silver Line's existing tunnels, stopping at Courthouse and World Trade Center stations; Silver Line Way would be eliminated. The Silver Line tunnel would be extended further on past D Street to serve two more stops—one at the Boston Marine Industrial Park, and another, the terminus of the line, in Southie's City Point. The Silver Line would remain as a South Station-Logan Airport enhanced bus that would receive signal priority and use the i Line's right-of-way on Summer Street, D Street and the Greenway with minimal adverse effects, if any, on travel time. Or, the Silver Line could become a North Station-Logan Airport i Line run, a key yet underserved direct corridor that would significantly bolster travel by transit to Logan from north of downtown, a trip that currently requires two transfers (Orange or Green-Blue-Shuttle or Orange or Green-Red-Silver). The North Station-Logan Airport run would be served by buses, not trolleys. The Longwood and Brookline portion of the Orange Line Extension would require tunneling under Longwood Avenue and Harvard Street, as well as under a few parking lots and some existing buildings. While doing so may be expensive, the construction would result in reliable, fast transit that would bypass all traffic and ease what is now a long, two-transfer transit journey between west of Boston and the Seaport. Additionally, the Orange Line Extension would significantly speed up service along the packed 66 Bus corridor, a long, convoluted, packed key bus route infamous for traffic jams and slow service—allowing for the 66 Bus's elimination. Ruggles Station is a short walk from Dudley Square, and plenty of bus options to and from Ruggles Station would remain for Dudley-area riders in addition to new enhanced buses from Ruggles to be discussed shortly. Likewise, Beacon Park is very near Harvard, and Harvard-area riders would be able to transfer to and from a new trolley from Beacon Park to be discussed shortly. For the Longwood Medical Area in particular, the Orange Line subway would significantly ease access. Traffic in Longwood is constantly gridlocked, largely due to the heavy demand for the area's resources and the tight, narrow street grid. The Orange Line subway would also make Longwood safer for emergency vehicles, as a significant number of drivers would likely use transit to avoid traffic headaches. Not to mention that the Orange Line Extension would link Boston University and Harvard University, both of which are located just by Beacon Park Yard, to the Longwood Medical Area, as well as to Northeastern University and the Seaport, directly. It is important to note that running Orange Line trains through the current Silver Line tunnels would rule out the possibility of building a continuous Silver Line from Dudley Station and the South End/Roxbury to the Seaport and Logan Airport. The southern Silver Line would instead connect with the new Orange Line at the proposed Ink Block Station, which would be adjacent to Washington Street and a very short walk from the existing Herald Street Station on the Silver Line. Ink Block Station would be a boon for the region of the South End around Ink Block—the area is beginning to be developed and still has development potential. As for the Silver Line, instead of the new tunnel that is currently proposed to be built to connect the two Silver Line branches, the Silver Line could be converted to a signal priority-enhanced trolley line that would enter the Green Line subway via the sealed Pleasant Street Portal, which is currently proposed to be used for the Silver Line tunnel, and continue onward through the Green Line subway to North Station or beyond. The trolley line could even, as has been proposed by many in the past, continue on further south than Dudley Station to Mattapan Square, providing transit-needy Dorchester, Mattapan and Roxbury with direct transit service to downtown. The trolley would either run in a dedicated, signal priority-enhanced right-of-way on busy Warren Street and Blue Hill Avenue, or a subway could be built from downtown to Mattapan via Dudley Station. The proposal to link the Silver Line (image also posted earlier on this page). The trolley line to Mattapan that could replace the Silver Line along Washington Street. The park's design would be similar to Southwest Corridor Park in the South End, which is built over the Orange Line and the Commuter Rail. The park would consist of walking and biking trails as well as planters, playgrounds and even playing fields—a greenspace amenity the developing area currently lacks. The park would ease the transition between downtown and the South End by providing a connection between the two neighborhoods that has never existed in Boston history. To further streamline Boston transit, it is crucial that certain upgrades be made to the existing system to ease travel between lines. The Red Line-Blue Line Connector, which has been proposed for years now, would solve one of Boston transit's greatest problems: the lack of a connection between the Red and Blue Lines. The lack of such a connector has become even more pronounced in recent years with the resurgence of Kendall Square as a tech hub as well as the increasing commercial and residential development in Somerville on the Red Line's northern end and South Boston and Dorchester on the Red Line's southern end. The incompatibility between the Red and Blue Lines will only grow more cumbersome as the East Boston Waterfront, served by the Blue Line, continues to develop. Not to mention that with Boston's business scene continuing to grow, as well as the possibility of hosting the 2024 Summer Olympics, traffic to and from Logan Airport will only continue to grow, and the Blue Line, with its high capacity, should be made as accessible as possible from around Boston so as to take stress off of the already-overburdened Silver Line through the Seaport. Ofsevit's proposal, while it may not yield the most aesthetically-pleasing result, would likely be much cheaper than a full subway tunnel and would be simpler to implement given the many existing underground utilities in the area. While it would leave the area under elevated infrastructure, Ofsevit's proposal, like a subway tunnel, would pave the way for further extensions to be covered later in this page that would revolutionize Boston-area transit. Another way to provide a Red Line-Blue Line connection, albeit an indirect one, would be to build a second i Line branch onto New Chardon Street off of the Congress Street right-of-way. 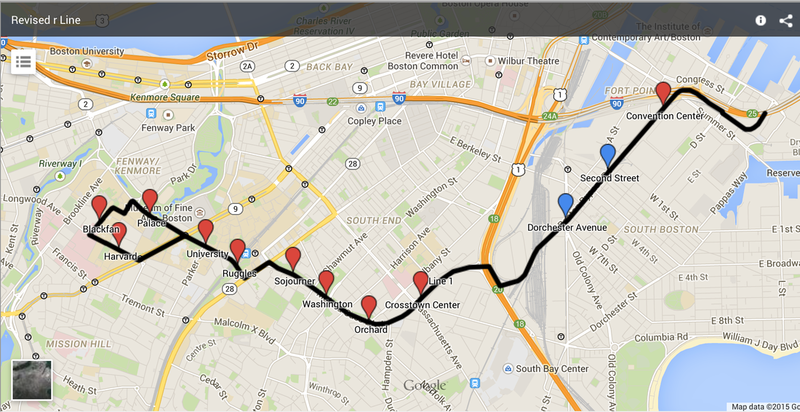 The trolleys would then stop at the Blue Line's Bowdoin Station and subsequently Charles/MGH. Such a connector would admittedly be less convenient than a actual direct connector, yet it would provide much easier access between the Red and Blue Lines than walking as well as provide more direct access to Massachusetts General Hospital with a stop by Blossom Street. 1906 Boston Transit Commission report showing the proposed "Riverbank Subway". Embankment Road and the Esplanade in 1929. As is shown above, the reconstruction of Embankment Road would allow for the reclamation of much of the Esplanade as parkland with space to spare for a riverfront rapid transit line. Alternatively, a subway could be constructed, which would be less scenic. My vision for a Esplanade rapid transit line is a surface light rail line that would allow residents and visitors alike to take in the view of the Charles and the architecture of the Back Bay. Such a line would be built in conjunction with restaurants and small shops along the river, bringing commerce and bustle to a region currently dominated by a road. The potential for an interconnected riverfront trolley is yet another reason to build an i Line spur to connect Bowdoin (Blue Line) and Charles/MGH (Red Line) stations, whether alone or in conjunction with a one-stop Blue Line Extension. The riverfront rapid transit line would ultimately extend to Beacon Park Yard, where it would meet the Orange Line Extension. A connection would be made with the Green Line along the way at Kenmore Square. Building the line with trolleys would allow for the usage of the existing B Line right-of-way to reach Beacon Park Yard. 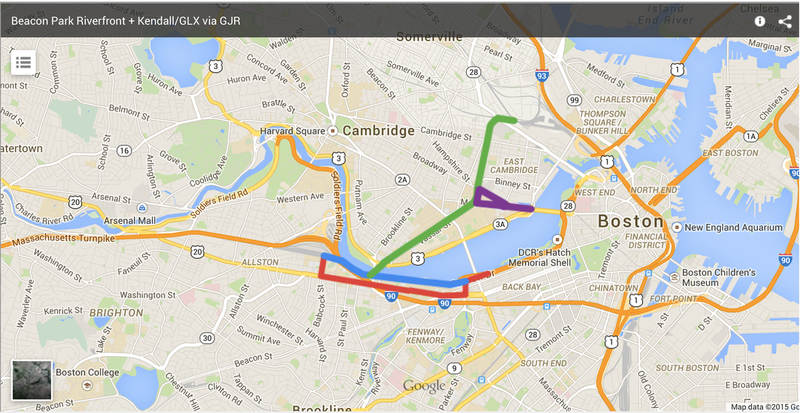 Alternatively, the line could extend further along the Charles River to Beacon Park. The Charles River routing would allow for the usage of either trolleys or Blue Line cars along the Grand Junction Railroad right-of-way to Kendall Square. Trolleys could subsequently connect with the Kendall Square extension of the i Line from Charles/MGH and/or continue further along the Grand Junction to meet the Green Line Extension in Somerville. Running a trolley line up the Grand Junction Railroad to the Green Line Extension would allow for a potential Tufts University-Harvard via Kendall routing that would connect BU, MIT, Harvard and Tufts—the u Line (u for University). 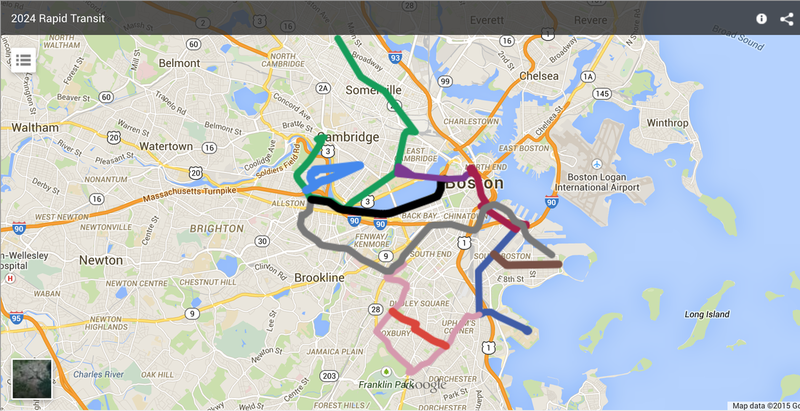 Northeastern would easily be able to get in on the game with a short ride up the Orange Line Extension from Ruggles. u Line trolleys would continue from Beacon Park to Harvard in mixed traffic throughout, ultimately ending in the Harvard Bus Tunnel (which was originally a trolley tunnel!). In order to bring the line to rapid transit speed, the trolleys would receive transit signal priority throughout. Alternatively, the tracks of the Green Line Extension and the Esplanade right-of-way could be paved for bus/trolley dual operation and the u Line could be an enhanced bus. A bus, unlike a trolley, would be able to pull to the side of the road to let passengers on and off. In addition to the u Line, a short mixed-traffic bus line to Central Square from Beacon Park would be run in order to allow area residents and workers to take advantage of the Orange Line Extension and the trolleys to downtown, North Station and area universities. The last line I would like to propose on this page is one that would revolutionize transit in Roxbury, a significantly transit-starved neighborhood. The line would be built as an enhanced bus—the line would receive dedicated rights-of-way where possible and signal priority at all traffic lights. The line would begin at Ruggles Station and continue from there to the Seaport and South Station, through not via Melnea Cass Boulevard as the r Line would. 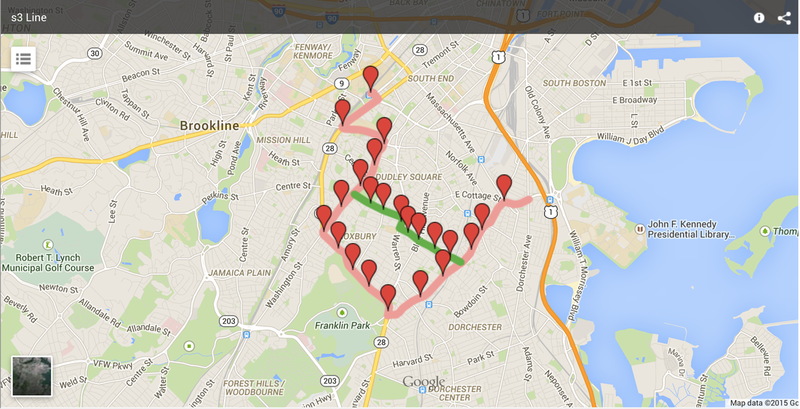 Rather, the line, to be called the s3 Line from here forth, would cut through some of Roxbury's main arteries. The s3 line would be split into two enhanced two-way bus lines—s3A via Martin Luther King Boulevard and Quincy Street and s3B via Seaver Street. Both lines would serve areas of Dorchester and Roxbury that under optimal circumstances are 15-20 minute plus walks from Dudley Station, the Orange Line, the Red Line and the Fairmount Line. Along Martin Luther King Boulevard, Seaver Street and Columbia Road, wider roads, the s3 line would receive a dedicated right-of-way. At Warren Street (s3A) and Blue Hill Avenue/Franklin Park (s3B), the s3 line would connect with the trolley line to Mattapan proposed earlier on this page. 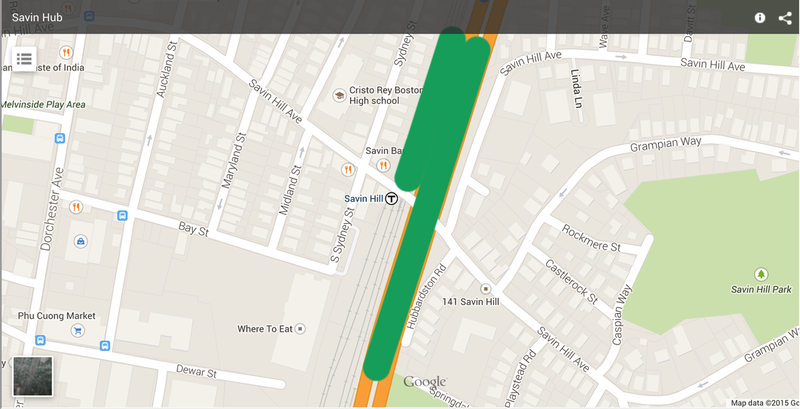 The s3 line would ultimately meet the s2 Line at Columbia Road and Dot Ave in Dorchester. 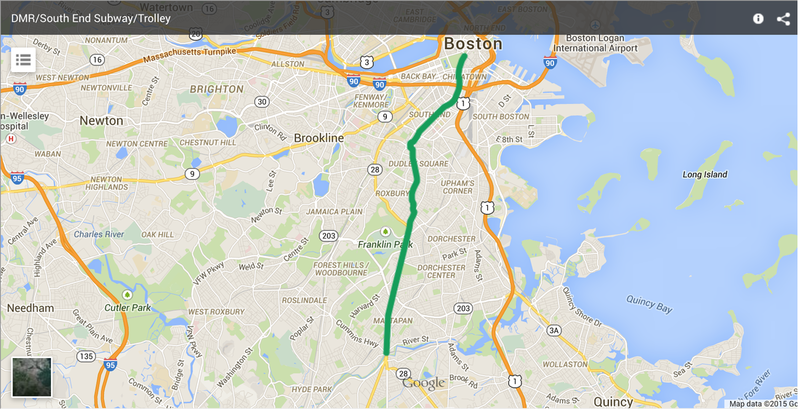 From Dorchester, the s3 line would continue to either Silver Line Way or North Station. With either terminus, the s3 line would provide areas of Dorchester and Roxbury further from Dudley Square and the Fairmount Line with more direct access to downtown, as well as to points of interest within the neighborhoods (Uphams Corner, Franklin Park/Grove Hall area, Egleston Square, supermarkets/restaurants, etc. ), than ever. The s3 line would also spur the development of commerce and arts in Dorchester and Roxbury and attract visitors to the area's rich cultural offerings, such as the Strand Theater in Uphams Corner. Additonally, the s3 Line would allow for the construction of practical affordable housing that does not require a car for transportation purposes. The proposed Back Bay-Seaport bus and the r Line would be replaced by the Orange Line Extension, which serves virtually all of the areas covered by the two eliminated lines. One area left unserved, however, would be the Orchard Park/Crosstown Center area of Roxbury formerly served by the r Line. However, with Dudley Station and Newmarket Station nearby, as well as nearby bus connections, the area still has fair transit coverage.